In this post you can read how you can harvest 2 heads of lettuce each week from April until December (from mid spring until late autumn). This applies to all types of lettuce. Lettuce seed germinates well at a low temperature, between aproximately 10 and 20 degree C (50 and 68 degree F). During long warm weather, lettuce seeds do not germinate well in the garden soil. At warm weather, you can sow many seeds in a small flower pot filled with compost, as described in chapter A)# and B)#. But when the flower pots are kept in a warm place after sowing, (20 to 30 C, 68 to 86 F) lettuce seeds do not germinate either, or only 1 plant out of 5 seeds shoots up. When you sow the seeds on moist toilet paper, at least half of the seeds germinate at a warm place (20 to 30 C, 68 to 86 F). When you put the seedlings in the garden soil, the tiny lettuce plants can be eaten by slugs or snails or other animals. That’s my experience. The best method is germinating seeds on moist toilet paper and letting the mini-plants grow some bigger on the moist toilet paper. Put 1 or 2 small lettuce plants in a small flower pot filled with compost or potting soil. Put the pots with lettuce plants in a tray for easy watering; pour some water on the bottom of the tray. Let the plants in the flower pots grow bigger ‘at home’ or in a greenhouse or under a greenhouse tunnel. Take the lettuce plants (with root ball) out of the flower pots and plant them in the garden soil. These plants are so big that they are not eaten by slugs or snails or other animals. Let the lettuce plants grow into big heads. In chapter D)# Sow in the garden soil from May to August (mid spring until late summer) there is a step by step description. This procedure (sowing on moist paper and planting in a flower pot) works also well for early lettuce, as described in A)# and B)#. Very handy. 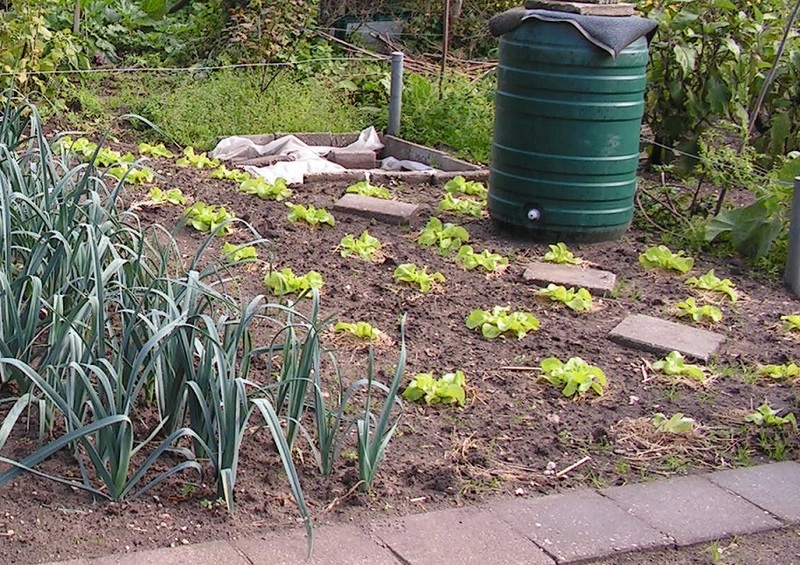 Below there are photos showing a simple procedure of sowing and growing lettuce in the garden soil. You can harvest 2 big lettuce heads weekly. Then select 2 spots in your garden weekly. On each spot sow about 7 lettuce seeds and cover them with a thin layer of garden soil. When lettuce plants are about 1 inch high, pull out all lettuce plants but 2. Do this on each spot. After thinning out, there are 2 plants on each spot that grow bigger. After some weeks, plants are 2 inch or bigger. Then pull out the smallest lettuce plant on each spot, so 1 plant is left in the soil. On each spot 1 plant will grow into a big lettuce head. With 2 spots, there are 2 lettuce heads. In this way you don’t have to replant small lettuce plants. The plants continue to grow on their original spot in the garden soil. No replanting means less work. And there are no flacid, pathetic looking lettuce plants for many days after replanting. When you sow 2 groups of lettuce seeds weekly, you will get 2 big lettuce heads that can be harvested. You can harvest lettuce weekly for a long time (“all summer and autumn long”). When you sow 2 groups of lettuce weekly, this will result in 2 big heads most of the time. But sometimes one lettuce head will form a flower or the leaves start rotting. This lettuce head will not be harvested. Luckely you have still another (good) lettuce head to harvest. And when you have 2 good lettuce heads, you can give one to a neighbour, friend or acquaintance. A) Sow indoors in December, January and February (winter months). Plant out in the garden soil in a tunnel greenhouse at non freezing weather. C) Sow in the garden soil in April (early to mid spring). Cover the small plants with transparent flower pots (or transparent plastic boxes). D) Sow in the garden soil from May to August (mid spring until late summer). A)# Sow indoors in December, January and February (winter months). Plant out in the garden soil in a tunnel greenhouse. Sow lettuce indoors. Sow weekly from December to end of February (during winter months). Below you can read how to sow lettuce in a flower pot filled with compost or potting soil. But you can also sow lettuce on moist toilet paper and replant the small lettuce plants in flower pots with potting soil or compost. That goes very well. More info in chapter D5) . You can sow in 2 small plastic flower pots with inserts and strips. Taking out the plants with rootball and planting in the garden soil is easy. This is described in tip 30 . Put strips in flower pots with inserts. Fill with potting soil or compost. Press a little on the sowing soil, for example with the bottom of another flower pot. Lay 5 or more lettuce seeds on the sowing soil. Cover the seeds with a thin layer of potting soil or compost. Spray water on the soil. Place the pots in a “small greenhouse” at a temperature between 14 and 18 deg C (57 to 64 F). Info about this small greenhouse in tip 2 . Lettuce seeds germinate at a relative low temperature: about 14 to 18 C (57 to 64 F). Below 14 C (57 F) germinating is very slow. Above 19 C (66 F) lettuce seeds do not germinate or germinate very slowly; it is too warm then. Fill some mini greenhouses each with 1 flower pot with seeds in potting soil. Put the greenhouses at various places in your house. Check germination at each flower pot, 4 to 6 days after sowing. In the photo above you see small plants in 2 flower pots; left side pot and middle pot. In the right side pot there are no plants visible. That means that at 2 places the temperature was okay and at one place the temperature was not okay. When there are no small lettuce plants after 7 days of germination, the greenhouse was at a too cold or too hot place. Or lettuce seed is old. Remove the top margarine box when little plants are visible. You better remove the top box too early than too late. When removing the top box too late, you get lettuce plants that grow very thin and long. Place the plants in a light and cool area at 15 to 19 C (59 to 66 F). The lighter and cooler the better. You can put the plants indoors, for example against a window of a bed room, of a kitchen, a skylight of an attack etcetera. These windows must be at the non-sunny side of the house. The plants grow at a cool, light place. When plants are at a warm and/or a dark place, they grow very rangy. When the lettuce plants in the pot are about 3 centimeters (1.2 inch) high, remove plants until there are 2 plants left in each pot. Then spray the plants and the sowing soil. When plants are more than 5 centimeters (2 inch) high, you can plant them out in a greenhouse at your garden in non freezing weather. When freezing, keep the pots with plants indoors and wait for non freezing weather. Then plant them out in the garden soil. Further in chapter A3) replanting is described. You can keep the flower pots with lettuce plants indoors for a longer time. Indoors the plants grow faster than outdoors in the garden soil (in a greenhouse). When 2 plants in a flower pot are about 5 centimeters (2 inch) or higher, they can obstruct each other. Then carefully pull out the smallest plant out of the sowing soil in the pot. Keep the biggest plant in the flower pot. Spray the plant and the sowing soil. Let the plant in the pot grow bigger indoors. Replant the plant in the garden soil (in a greenhouse) on a later day. Fill each flower pot with sieved compost or sieved potting soil. Press on the sowing soil in each flower pot. Pressing on sowing soil goes well “with the bottom side of an other flower pot”. Compressed sowing soil does not fall apart so easily during putting in the garden soil. Spray cold tap water on the sowing soil. You can put lettuce seeds in a (white) plastic cap or in a small tray. Use tweezers or the wetted end of a small cocktail stick to pick each seed. Put 5 lettuce seeds on the sowing soil in each flower pot. Cover the seeds with a thin layer of dry sand or sowing soil. Covering with dry sand is easiest. You can easily scoop and sprinkle dry sand on the seeds using a small tea spoon. Sometimes lettuce plants grow very thin and long. Below some tips to repair or to prevent this way of growing. 1) Filling pots with less sowing soil. Before sowing, fill the flower pots with potting soil or compost to a “lower level”, a little above half. Then the plants “grow deeper” in the flower pots. When the plants are about 2.5 centimeters (1 inch) high, you can put more sowing soil in the flower pots between the plants. From that moment on, the plants grow at a correct depth in the soil. Use a small tea spoon to press on the sowing soil between the small plants. When needed add some more sowing soil between the plants and press on the soil. This pressing prevents the root ball from falling apart during putting in the garden soil. 2) Removing a layer of sowing soil from the bottom of the root ball. Take the root ball with plants out of the flower pot and put it on a (wooden) board. Carefully hold the root ball between thumb and fingers and remove some soil from the bottom side. That goes well when using a small knife. Carefully put the root ball with small plants back in the flower pot. Put some sowing soil in the flower pots between the plants. From now on, the plants grow at a correct depth again. From beginning of winter you can put lettuce plants in the garden soil under a tunnel or in a greenhouse. Plants must be about 4 centimeters (1.5 inch) or higher when planting out. Before replanting, put the plants in a room at about 10 to 15 C (50 to 59 F) for 1 day or longer time. So they can get used to the lower temperatures. Plant them in the garden when the soil is not frozen and at non freezing weather. When freezing outside, keep the plants indoors for a longer time. Wait until the next non-freezing day. Below is a general description of how to put lettuce plants in the soil easily. Spray water on the soil in the flower pots. This makes the root ball more firm, so it does not fall apart so easily during the next steps. Loosen the garden soil and mix some manure or compost (and agricultural lime) through the garden soil. Put each flower pot with plants on the desired spot in the garden soil. Or put 2 empty flower pots (same size) in the soil. Press on the garden soil around each flower pot. Take the flower pots out of the garden soil. At each flower pot, take the insert out of the pot. At each insert, pull the plastic strip a few millimeters (1/4 inch) up and release. This is to release the root ball from the strip and insert. Carefully take each root ball with plants from the insert and strip and put it (drop it or slide it) into a hole in the garden soil. Pour or spray water on the root ball and on the soil around the plants. The root ball gets “stuck” in the garden soil then. And the roots of the plant can easily grow into the (new) garden soil. You can use a thin plant hole tube (plastic tube with rubber band) to make a well fitting hole in the garden soil. Push the tube in the soil until the rubber band touches the surface of the soil. Wiggle the tube until the hole in the soil has a \ / shape. Take the tube out of the soil. The hole in the soil is there. Use a garden scoop or wooden stick to tap against the tube (to remove the soil out of the tube). More info about plant hole tubes in tip 41 . 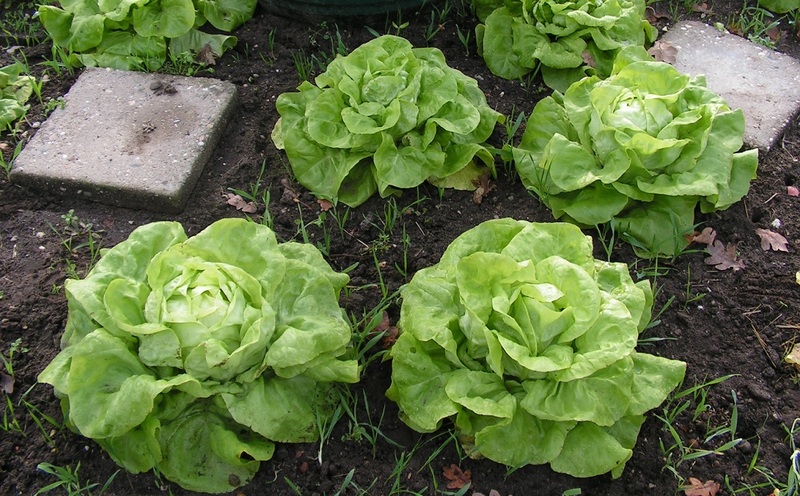 Lettuce plants can be put in the garden soil in winter, at non freezing weather. After planting, take care that the root ball does not freeze anymore. The lettuce plant can die from frozen roots. So you better put the lettuce plants in the garden soil under a tunnel or in a greenhouse. In tip 13 there is a description of a tunnel greenhouse. 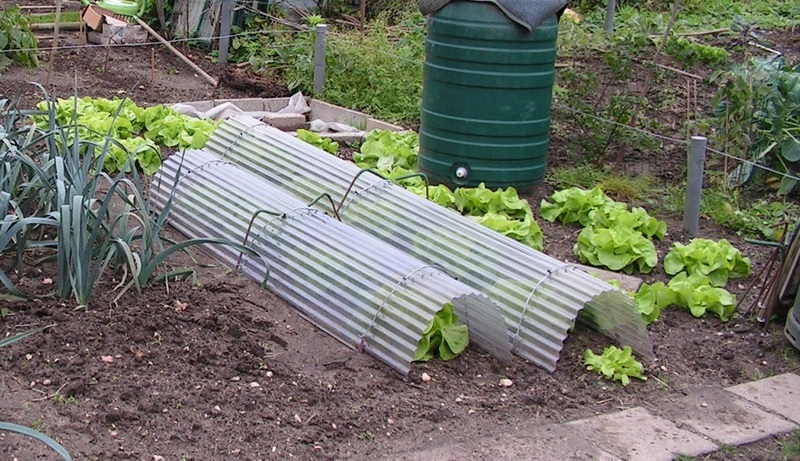 You can build the tunnel on the garden soil a few days before replanting lettuce plants. The garden soil under the tunnel can warm up then. Loosen the garden soil before building the tunnel. 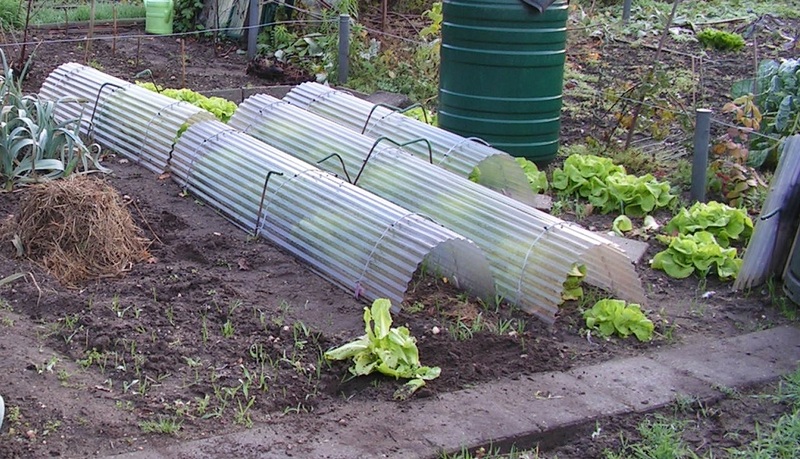 Put a tunnel of transparent corrugated plate or another greenhouse over (on) the garden soil. Close the tunnel or greenhouse, so the garden soil can warm up. Just before planting, open the tunnel or greenhouse. Mix the garden soil (under the tunnel or greenhouse) with some compost or manure (and agricultural lime). Put the lettuce plants in the soil as described at A3). 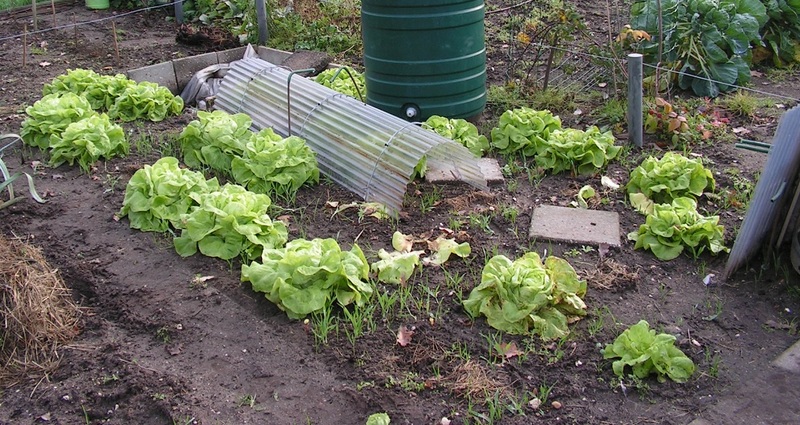 In early winter (December and January), do not put lettuce plants near both ends of the tunnel or greenhouse. Near the ends of the tunnel, temperature is much lower than in the middle (colder due to air openings between closing plates and tunnel). Keep a distance of about 0,5 meter (2 ft) from each end. 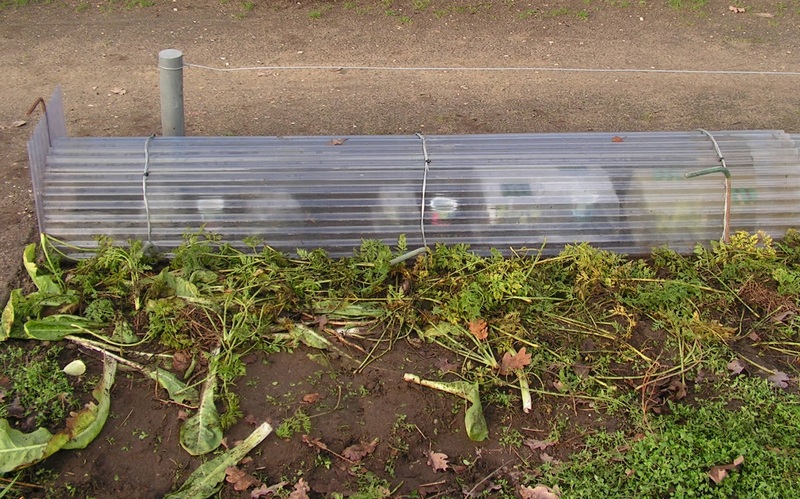 At the end of the winter (February) you can put lettuce plants near both ends of the tunnel. Put a watering can or a small tank or box with tap water in the tunnel. Soil and plants do not dry out so fast. At freezing weather, the water freezes before lettuce plants do. Close the tunnel or the greenhouse over the lettuce plants. Now lettuce plants can withstand light frost, with an outer temperature of about – 5 C, 23 F. Above that temperature, there is no freezing of the roots of the lettuce plants. Put a transparent flower pot (or a transparent plastic dessert package with holes in the bottom) upside down over each lettuce plant. Orchid plants are sold in these transparent flower pots. So when the orchid is dead, you have the transparen pot left. Transparent flower pots can also be bought on the internet, for example here . Shove some garden soil against the flower pot. This is to have no openings between the soil and the edge of the pot. Plants can freeze through these openings. Close the tunnel or greenhouse. These lettuce plants can withstand a moderate frost with an outer temperature of about – 10 C, 14 F (above that temperature, no freezing of the roots of the lettuce plants). Put a transparent flower pot over each lettuce plant. The edge of this flower pot is a few centimeters (about 1 inch) in the garden soil. Put another (a second) flower pot over the first flower pot. This forms a double plastic wall with a layer of air between. The plants can withstand a severe frost with an outer temperature of about – 15 C, 5 F (above that temperature, no freezing of the roots of the lettuce plants). Instead of 2 small orchid flower pots, you can put 1 orchid pot and a “transparent bucket” over each plant. More info about the “transparent bucket” at A5). These lettuce plants can also withstand severe frost with an outer temperature of about – 15 C, 5 F (above that temperature, there is no freezing of the roots of the lettuce plants). You can lay plant waste (or hay or straw) on the gardens soil against the side of the tunnel. To have less mud splashing against the tunnel during heavy rain. 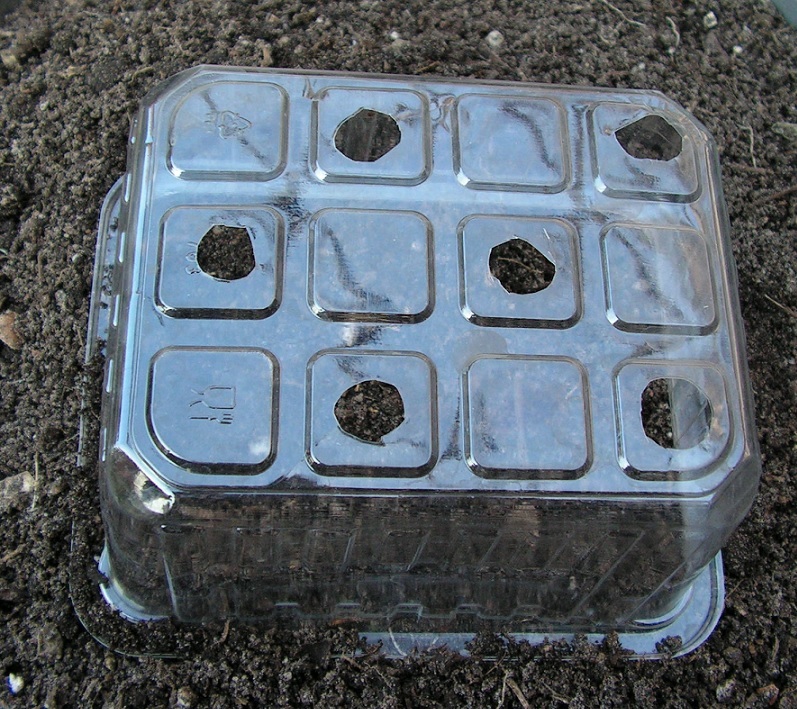 Instead of an orchid flower pot, you can put a plastic transparent box with bottom holes over a lettuce plant. Or put the transparent cover of a mini greenhouse over the plants. Use the point of a nail to prick small holes in the bottom of the box. Use small sharp scissors to make each nail hole bigger. 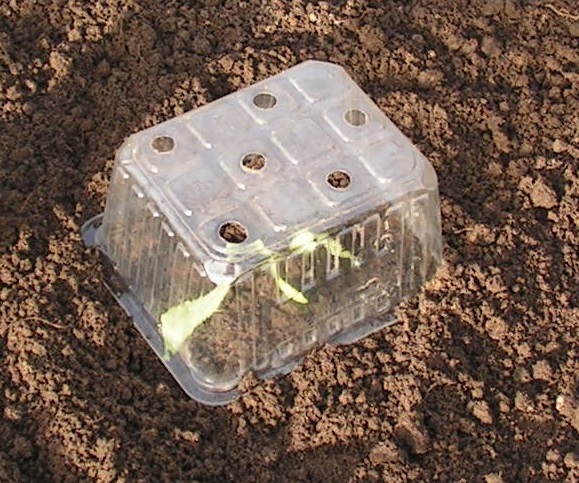 Put another transparent box with bottom holes over the first plastic box, on the shoved garden earth. In this way there is double protection against cold. When you don’t have a tunnel, you can plant the lettuce plant under a “bucket greenhouse”. It consists of a transparant orchid flower pot and a transparant bucket with air holes over it. Put a brick on to prevent blowing away. In tip 2 you’ll find a description of the “bucket greenhouse”. At colder or warmer weather you can put no transparent pot, 1 transparent pot or 2 tarnsparent pots (one on top of another) under the bucket greenhouse above the plant. Water the plants when needed. You can easily water the plants via the holes in the bottom of the orchid pots or in the flower pots that are put upside down. At a good protection against freezing weather, the soil around the roots of the plants will not freeze. The lettuce plant will not die during the cold weather. At very cold weather, the leaves of the lettuce can freeze. That is no problem. Lettuce can withstand that. When temperature rises, the plant goes on growing again. Put on the flower pots or remove them, depending of the forecasted night temperature, day temperature or sunshine. When the plants are about 5 cm (2 inch) high, pull out the smallest plant(s) at each planting spot. So 1 plant remains. Then water the plant. In March (late winter, early spring) remove all flower pots that were over the plants under the tunnel or greenhouse. From that moment on, lettuce plants grow under the tunnel or greenhouse. Only single protection against cold. From March (late winter, early spring) on, you can put new small lettuce plants under the tunnel or under one transparent flower pot. With only single protection against cold. That’s warm enough. Lettuce plants can withstand some freezing weather. B)# Sow indoors in March (late winter, early spring). Plant out in the garden soil under small transparent flower pots. Sow lettuce each week in March (late winter, early spring). Sow indoors. In March (late winter, early spring) it can be very cold weather, so lettuce seeds do not germinate in the garden soil. You better sow indoors. Sow in 2 small plastic flower pots with inserts and strips. Taking out the plants with rootball is easy then. This procedure is described in tip 30. Below there is a description of sowing lettuce in flower pots filled with compost or potting soil. But you can also sow lettuce on moist toilet paper and replant the mini plants in flower pots filled with compost or potting soil. That goes well too. Info in chapter D5) . When you want to sow in the garden soil in March (late winter, early spring), read at B3) Remark how to do that. Fill with potting soil or compost. Press a little on the sowing soil, for example with the bottom of another flower pot. Lay 4 or 5 lettuce seeds on the sowing soil. Cover the seeds with a thin layer of potting soil or compost. Spray water on the soil. Place the pots in a “small greenhouse” at a temperature between 14 and 18 deg C (57 to 64 F). Info about this small greenhouse in tip 2. Put the small plants in the garden soil at non freezing weather. Put each flower pot with small plants (or an empty same size flower pot) in the garden soil. Press on the garden soil around each flower pot. Take each flower pot out of the garden soil again. At each pot take the insert out. Pull the plastic strip a few millimeters (1/4 inch) up and release. This is to release the root ball from the strip and insert. Repeat this at both inserts. Put a transparent flower pot (Orchid pot) over the small lettuce plants. Shove some garden soil against the flower pot against blowing away. At dry weather you can water through the holes in the bottom of the flower pot. At warm weather you can remove the transparent flower pot and put it back on when it’s colder again. At a long period of warm weather and/or when plants are big, do not put the transparent flower pots over anymore. Instead of an orchid flower pot, you can put a plastic transparent box with bottom holes over a lettuce plant. When lettuce plants are about 3 centimeters (1.2 inch) high, pull out lettuce plants until 2 plants are left. Water the plants. When plants are about 5 centimeters (2 inch) high, remove 1 plant per spot, so 1 plant remains. Water the plant. In March (late winter, early spring) you can sow lettuce seeds in your garden soil directly as described in chapter C)# . Sow on the desired spot in the garden. The plants are not replanted later. Before sowing the soil must not be frozen. Spray water on the soil, sow the seeds and cover the seeds with a thin layer of moist garden earth. Cover the seeds with a thin layer of moist garden earth; you can put some garden earth in a plastic flower pot and strew the earth through the bottom holes on the seeds. Put a black plastic flower pot over the sowing spot. Under this black flower pot, temperature is good for germination. Shove some garden soil aginst the pot (against blowing away). Further in this tip more info about putting a black flower pot over the sowing spot. In March (late winter, early spring) you better put a transparent flower pot over the black flower pot. Germination temperature is better during cold freezing nights. Shove some garden soil aginst the transparent orchid pot (against blowing away). As shown on the rightside photo. The soil under the 2 pots will get warm enough for germination. When lettuce plants are above the soil, remove the pots. Then put the transparent orchid pot over the small lettuce plants. Remove or place the orchid pot when needed. When plants are big, or at a long period of warm weather, no flower pots over the plants are needed. In April (early to mid spring) you can sow lettuce directly in the garden soil. Sow on the desired spots in the garden. The plants are not replanted later. When small plants are visible, a transparent flower pot is put above them against cold. Sow weekly 2 groups of lettuce in manured soil. Description below is for each sowing spot. Loosen the soil and mix with manure or compost. Spray water on the soil. Lay 5 to 15 seeds on it and cover it with a thin layer of moist earth. Place a small black empty flower pot over it. Put some earth against the edge of the black flower pot (this is against blowing away). After 5 to 15 days plants are visible. Remove the black pots. Put a transparent flower pot over it against cold. Cover the edge of the transparant pot with earth (against blowing away). Remove or place the transparent pot depending on the weather. At each sowing spot, you can sow many seeds. Big chance that plants will grow very close to each other then. Thinning out is not so easy then. You can divide a sowing spot into 4 parts. Sow less seeds in each part. On this photo you see a “normal” flower pot at the right side. At the left there is a rigid red plastic flower pot. It has small holes near the upper edge. With 2 pieces of satay stick in these holes. Before sowing push the (red) pot with satay sticks (opside down) in the moist garden soil and take it away. In this way you make 4 sowing spots in the soil. Put 3 or 4 seeds in each spot. Cover with moist garden soil. Put a black flower pot over it and shove garden soil against the pot. From May (mid spring) on you can sow lettuce directly into the soil. Sow on the desired spots in the garden. The plants are not replanted later. This procedure works well during a summer with moderate temperatures. But at (very) high temperatures, lettuce seeds germinate very poor in garden soil. Lettuce seeds germinate well between 10 and 20 C (50 and 68 F). Above 20 C (68 F), lettuce seeds do not germinate in garden soil or germinate very poorly. Best procedure at high temperatures is germinating lettuce seeds on moist toilet paper. Let the plants grow some bigger on moist toilet paper. Put 1 or 2 small plants in a flower pot with compost or potting soil. Let the plants in the flower pots grow bigger “at home” or under a greenhouse tunnel. Get the plants out of the flower pots and plant them in the garden soil. Let them grow into big heads. In chapter D5) Sowing lettuce at hot, dry (summer) weather there is a step by step description. Put a mark stick in the soil near the small plants. When plants are 1 to 1.5 inch high, remove at each group some plants until 2 plants are left. Spray the plants aftter removal. When plants are 2 to 3 inch high, pull out one plant per group so one plant remains. Then spraying. You can cut away the bottom (and a little piece of side wall) from a transparent orchid flower pot. Put the pot upside down over the small lettuce plants. The pot protects the small plants against mud splashing during heavy rains. Remove the pot when plants are bigger. This bottomless pot also protects the plants against slugs. More info at F2). Cutting the bottom of an orchid pot must be done carefully. The plastic easily breaks or tears or cracks appear. When the crack is not big, the pot can still be used. Lettuce seeds germinate well between 10 and 20 C (50 and 68 F). During warm (hot) weather, lettuce seeds germinate poor in garden soil; when sowing 10 to 15 lettuce seeds in a group, 0,1 or 2 plants crop up. Within 1 week or so, the tiny lettuce plants can have been eaten by slugs or snails. The best method (at hot weather) is germinating lettuce seeds on moist toilet paper. Let the mini-plants grow bigger on the moist toilet paper. Put 1 or 2 small lettuce plants in a small flower pot filled with compost or potting soil. Let the plants in the flower pots grow bigger ‘at home’ or in a greenhouse or under a greenhouse tunnel. Remove the bigger plants (with root ball) from the flower pots and plant them in the garden soil. Let the lettuce plants in the garden soil grow into big heads. More info about this procedure in tip 2) nr 73. Put 1 layer of toilet paper in a margarine box or tray. You can fold a small gray plastic plate in 1 sheet of toilet paper and lay it in the box. The gray plate makes the small plants clearly visible. Spray cold tap water on the toilet paper. Lay lettuce seeds on the moist toilet paper. Put a well fitting lid on the box. Put the whole at a cool spot, at about 15 to 22 C (59 to 72 F). But a warmer spot is okay too; many lettuce seeds germinate on moist toilet paper between about 22 and 30 C (72 to 86 F). Each day, check the germination of the seeds. Continue until many mini lettuce plants are growing on the toilet paper. Remove the lid from the box. Put a transparent plastic box over the box with lettuce plants. Put the whole on a light spot, at about 15 to 25 C (59 to 77 F). Let the lettuce plants grow bigger on moist toilet paper. When needed, take the transparent box away, spray water on the paper and put the transparent box on again. After a few days, lettuce plants are this big, big enough to plant in flower pots. Pick one small lettuce plant from the moist toilet paper. It can happen that a small piece of toilet paper sticks to the root of the plant. That is no problem. When needed, cut a little piece of the root. This makes planting easier. Fill a small flower pot (with insert and strip) with moist compost or potting soil. Use a tea spoon to make a small groove in the compost (or potting soil). Put 1 or 2 small lettuce plants in the groove. Shift compost (or potting soil) around the plants. Spray cold tap water on the soil. Fill more flower pots with soil and put lettuce plants in. You can put some flower pots in a (ice cream) tray. Regularly spray water on the plants, the soil or via a layer of water in the (ice cream) tray. Let the plants grow bigger “at home”. That is safer than planting in the garden soil, where some plants can be eaten by slugs or so. At (temporary) cold weather you can put flower pots in or under a greenhouse (tunnel). Let both ends of the tunnel open to prevent too high day temperatures in the greenhouse. Let the lettuce plants in the pots grow to about 5 to 10 centimeters (2 to 4 inch). Take the plants with root ball out of the pots and plant them in the garden soil. Let the plants grow bigger in the garden. At 2 plants; pull out the smallest plant. Water the remaining plant and the garden soil. Let the (biggest) plants grow into big lettuce heads. At warm, dry weather lettuce plants can dry up or die due to lack of water. You can put a thin layer of (dry) hay around each lettuce plant. The soil does not dry out so fast and watering the plant goes much better (water flows along the hay leaves into the soil). From September on (end of summer), lettuce plants grow slower due to cold weather or cold nights. You can put a transparent tunnel over the (2 to 4 inch high) lettuce plants. Close one end of the tunnel with a plastic transparent plate. Leave the other end open. At cold weather you can put a transparent plastic plate at that end of the tunnel too. In each flower pot, 5 lettuce seeds have been sown on moist compost and covered with a thin layer of dry garden sand. In each margarine box, 8 lettuce seeds have been laid on moist toilet paper. The flower pots and margarine boxes have been put (next to each other) outside under a roof. Temperature between 25 and 30 C (77 and 86 F). Only 2 lettuce plants have been shot up in 6 flower pots (with 30 seeds in total). One week later, no more plants visible. In each margarine box, at least 5 lettuce plants have shot up. So more than 50 % of the seeds turned into plants. Conclusion: When sowing lettuce seeds on moist toilet paper, you can get many lettuce plants, even at warm (hot) weather. And: Sowing lettuce seeds in the garden soil or in a pot filled with compost at (very) warm weather does not work well. Only very few lettuce plants emerge. I don’t know the results of sowing lettuce in potting soil at high temperatures. Sow many lettuce seeds on moist toilet paper round August 15 (mid to end of summer). Act as described above in chapter D5) and D6) . Put the mini lettuce plants in flower pots with compost or potting soil. Put the flower pots with small lettuce plants in a low tray. Put the trays with flower pots (with lettuce plants) under a tunnel greenhouse on the garden soil. Both ends of the tunnel are open (to prevent too high temperatures under the tunnel). Instead of a tunnel you can use a greenhouse. At mid September (end of summer) the lettuce plants are big enough to be replanted in the garden soil. You can plant the lettuces in the garden soil at the “old potatoe field” (where the potatoes have grown). Take the lettuce plants with root balls out of the flower pots and put them in the garden soil. When needed put some manure in the planting holes before replanting. You can put a thin layer of (dry) hay around each lettuce plant. The soil does not dry out so fast and watering the plant goes much better (water flows along the hay leaves into the soil). The hay also protects the soil around the plants against cold during the nights. Date: October 1 (early fall). Lettuce plants on the old potato field next to rows of leeks. Put open greenhouse tunnels over (some) lettuce plants at mid October (early autumn) to protect the plants against heavy colds during the autumn nights. Date: November 1 (mid autumn). Lettuce plants in the open air or under a tunnel. Date: December 1 (late autumn). Lettuce plants in the open air or under a tunnel. Lettuce plants at December 5 (late fall). Many good, big lettuce heads growing. Ready to harvest before the weather gets really cold. When lettuce plants are very small, put a mark stick or label in the garden soil. This prevents the little lettuce plants from getting hoed or stepping on. In a backyard garden, your lettuce plants can be eaten off by birds. For example sparrows in Europe. I also grow vegetables in the garden of a primary school in my residence. Many snails eat at the lettuce plants there. To prevent the snails from eating the lettuce, you can use these “snail fences”. They are made of a strip of wire mesh, bent in a cylindrical form. Use iron wire netting with a 12.7 millimeter (0.5 inch) mesh. Use scissors to cut ribbons of about 1 meter long and 5 to 6 centimeters (2 inch) wide. Cut the netting “in the middle of the squares”. In this way there are short iron wires at the long sides of the ribbon. These wires are about 6 millimters (1/4 inch) long. Big snails or big slugs can not pass these pointed, sharp fences. Bend the ribbon into a round cylindrical form. Let both ends overlap. Put a narrow plastic strip through the meshes to fix both ends. Put the snail fence around a lettuce plant. See the photo above of the school garden. There are 3 fences visible. You can put a bottomless transparent flower pot (upside down) over a small plant. This also prevents snails from eating the lettuce plant. More info about snail fences in tip 2, nr 71. Sieved potting soil or sieved compost is good for sowing in small flower pots (with inserts). You can mix it with some manure and/or agicultural lime. Lettuce seeds germinate fast at a temperature between 14 and 18 C (57 to 64 F). The black flower pot keeps the soil cool at hot weather and warm at cold weather. The black pots also prevents the soil from drying out or getting flushed away at heavy shower. The flower pots indicate the sowing spots. The transparent (Orchid) flower pot acts as a mini greenhouse over a small plant. Place transparant pots slanting over big plants, with the opening towards the “sunny side” (south). Put the transparent pots over the plants only at cold weather or at night frost. Lettuce can withstand a few degrees of frost. At dry weather you can pour water through the holes in the bottom of a flower pot. Do not sow more than 2 groups of lettuce each week until July (early summer). Sow lettuce twice a week in July, August and September (summer). To make sure that you always can harvest big lettuce heads in autumn. Sow 3 or 4 groups of lettuce in July, August and September (summer). Also to make sure that you always can harvest big lettuce heads in autumn. Sow 15 seeds per group during summer months ; during hot days less seeds germinate. Or sow on moist toilet paper and put the mini lettuce plants in flower pots. When plants are bigger, plant them in the garden soil. Put big flower pots over lettuce heads (when hail is forecasted). Put a remarkable stick or label in the soil at the small lettuce plants. On this photo you see a transparant pot over a big plant, opening towards South, bottom towards North. In this way there is a mini greenhouse over a big plant. 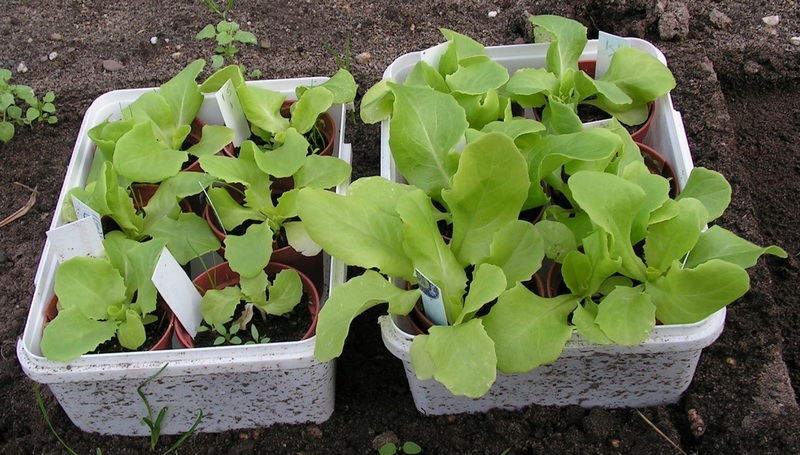 Begin of April (early spring): big and small lettuce plants under pots. Mid April (spring): same big and small plants (+ 2 new ones). May (spring): same plants as in April (+ 2 new ones). Big flower pots over lettuce heads (when hail is forecasted). When there is no garden with fertile soil, you still can grow lettuce. Below a description. Use a low (plastic) tray. Length x widt x height are about 45 x 35 x 20 centimeters (18 x 14 x 8 inch). You can make a tray out of a (Curver) unibox by sawing off the top part of all 4 sides. Drill small draining holes in the bottom of the tray and below in all 4 sides. Fill the tray with a mixture of compost, agricultural lime and manure. Put (2) lettuce plants in this mixture. Use iron wire netting with square meshes of 12.7 mm (0.5 inch). Use sharp scissors to cut one or two strips of 6 meshes (7 to 8 cm , 3 inch) wide. Cut “in the middle of the squares”. In this way, the strip gets sharp iron wires at one or both long sides. Fasten the strips of netting wire over the edge of the tray. Bend the sharp iron wires outside a little. This prevents snails and slugs from climbing into the tray from the outside. Use a (well fitting) piece of insect screen mesh. Cut the screen mesh from aside towards the position of lettuce plant. And make a cross shaped cut at the position of the lettuce plant. Lay the screen mesh on the soil. The insect screen mesh prevents snails and slugs (living in the soil) from getting on the leaves of the lettuce plants. Lay heavy pebbles on, to minimize upcurling of the screen mesh. Use a piece of iron wire netting, mesh size 1 inch. Width of the netting about 50 centimeters (0.5 meter, 20 inch). Fold the netting in two. Put the double netting wire at the outside edge of the tray. With the bended side up and the 2 ends down. Shift and fold the ends of the double netting wire to form a rectangular fence of netting wire. Bend the lower part of the “inner netting wire” inward a few centimeters (1 inch). Push this bent part of the netting wire against the sides of the tray (at the inner side). In this way the iron wire mesh is supported by the edge of the tray and will not go down. Use plastified iron wire netting with big mesh (mesh size 6 to 10 centimeters, 2.5 to 4 inch). Cut a piece of (dark green) plastified wire netting. Cut in the middle of the wires. In this way you end up with a piece of plastified wire netting with long wires at the sides. Use a piece of (light green) plastic birds net. Put the net on the plastified wire netting. Fasten the net “over the long wires at the sides of the iron wire netting”. Lay the “plastified iron wire netting with birds net” on the vertical iron wire netting at the sides of the tray. The birds net and the wire netting keeps birds away from the lettuce plants. The structure is finished now. Another photo of the construction (on this photo, the pebbles are at the corners. better spread them over the whole surface). This entry was posted in early, lettuce. Bookmark the permalink.